Laminate floors- generally seem to be wood, but they are not. The entire part of the laminate is constructed. They can be shaped like nearly anything. However, most of the time, they are made to seem like wood. With times, laminates are coming with more options and laminate floors that have in common in looks with slate and ceramic are becoming popular on the market. These floors are an inexpensive option and easy to install. They can withstand damage for a long period of time. Since this flooring option is moisture resistant, it can be installed in many places like the basement and bathroom. Laminate flooring came into the picture in 1977. There is a huge market that sells cheap quality laminate. Beware of this while buying. Opt for the laminate certified by the top laminate manufacturing brand. If you buy a certified laminate flooring, you must know a few things. First, you will require no glue to fix this on your existing floor. Well, this is quite good for several reasons. Opt for a Snap-together laminate floor. This will allow you to install your it on your floor without any glue. The best part is that it does not harm the air quality of your room. 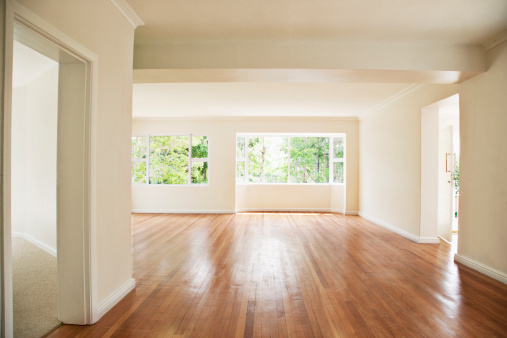 Everyone has heard about the “laminate floor.” There are five layers of laminate floors . 1. The upper layer is transparent and resistant to cats, dogs, and dents. 2. The next layer is a decorative one that offers a high-end and detailed image. The manufacturers know the technology and have the capability to transform any laminate from solid wood to granite. 3. The third layer is the high-density fiberboard core. It offers durability, stability and impact resistance. 4. The fourth layer consists of synthetic resin. It offers moisture resistance and additional durability. 5. The last layer is the underlayment. It is an important part of any installation. It is effective in reducing a few slight flaws of the sub floor and some noise. A few underlayments offer moisture resistance on one side. Therefore, it makes a good sub floor option for areas like bathroom and basement. Laminate flooring stays stuck together and stays above the sub floor or existing floor. It is easier to install a laminate floor on the sub floor or the existing floor as long as the old floor is flat and there is no carpet on it. How a flooring snaps and stays together determines how much a product will cost. Therefore, ask important questions before you make a purchase. Underlayment is an important factor for laminate installation. Sometimes, the bottom layer of the flooring material is the underlayment. And sometimes, you need to purchase a separate underlayment in a form of a sheet material. If you want to install laminate on the concrete or in the spaces with lots of moisture, you need to place an added moisture wrap using adhesive like vyna bond. It is essential to ask a few questions before you purchase the final flooring for your requirements. Ever since the laminate flooring has come into existence, the printing technology has improved a lot. You can find out options galore. There is a laminate flooring that imitates the appearance of the wide, pine -plank floor. Not every laminate looks like wood floors. The technology that has improved the look of laminate can now make laminate floor look like tiles. If you are on a tight budget, this floor option can be a great fix for a tired floor. What about a floor that mimics the look of a black slate. Well, the black slate laminate is not for everyone. If anything goes wrong with your existing flooring, laminate floor can offer you a solution. More to this , since snap-together laminates are not attached to anything, it is easier to uninstall them than installing them in the first place. If you want a temporary solution to your problem, you can use this flooring option. These are some of the laminate flooring options. This flooring options do not require any special attention or cleaners to keep its appearance intact. The best part, you do not need to wax or polish this.